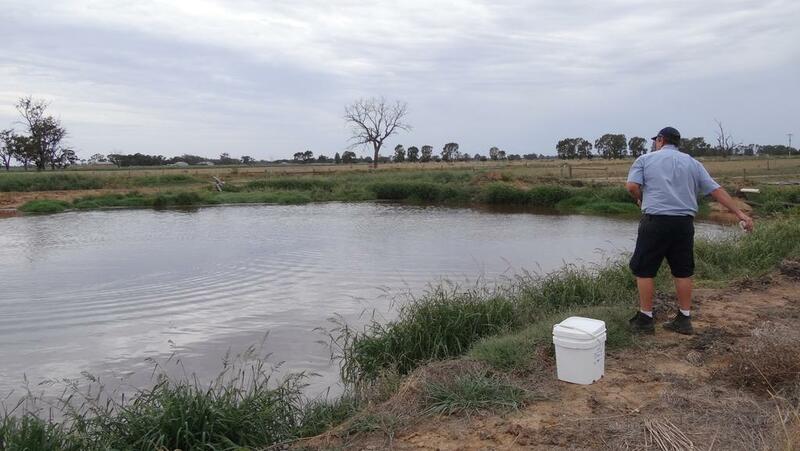 A NEW ecological method of getting rid of suspended solids, sludge and chemicals in manure ponds and farm dams will be on show at the field days. Distributed in Australia by Bio Natural Solutions, of Tullamarine, Dam Buster is a blend of live, cultured bacteria which eats away at organic matter until the water is PH-neutral and unpleasant smells, surface crusts and any “rotten egg gas” (hydrogen sulphide) have disappeared. Dam Buster was released a year ago and had its first public showing at International Dairy Week at Tatura. Managing director Robert Weston said Bio Natural Solutions acted as a wholesaler, selling initially through GV Dairy Supplies in Shepparton. The story starts with ROEBIC Laboratories in Connecticut, US, established in 1959 to produce environmentally friendly products to help consumers with their sewage disposal. ROEBIC’s range has now grown to consist of 35 products. “They developed the patented RoeTech line of bacterial cultures and we’ve adapted one of those to produce Dam Buster for sludge removal, cleaning septic tanks and stock troughs and wastewater treatment in such places as abattoirs, farms and piggeries,” Mr Weston said. “All we did was add an oxygenation agent. “We mix it together in 250g soluble bags which are simply thrown into the dam, sold in terms of dam sizes — quarter-megalitre to five megalitres. “This product is one of a kind. It’s certified biodegradable and approved by AQIS and Good Environmental Choice Australia. “On Christmas Eve, we started treating a five-megalitre dam near Kyabram and the farmer’s gobsmacked. “In virtually six weeks, Dam Buster got rid of the sludge on top and silt at the bottom, and it turned to clean water. “We’ve also done dams in western Victoria and near Wangaratta. “Up until now, it’s been very expensive for dairy farms to dredge up that waste, but to treat a one-megalitre dam will cost $418, including GST. GV Dairy Supplies owner Paul McGrath said he was encouraged to stock Dam Buster after free on-farm trials managed by Mr Weston proved successful. “There’s clearly a need for a product like this among the dairy farming community,” Mr McGrath said.